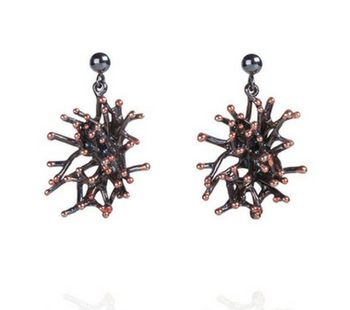 A pair of solid sterling silver earrings with black rhodium and 18 karat rose gold finishes. Keiko Uno’s Anemone series is inspired by soft and sensual sea anemone and the colourful marine characters that inhabit them. The Anemone series forms part of Keiko Uno’s luxury sterling silver Rockpool Collection.